Kinvara in Stranraer, Dumfries and Galloway sleeps 14 people. Kinvara in Stranraer is a spacious detached villa which is situated in a quiet area on the edge of this bustling harbour town. Situated at the head of Loch Ryan, it’s the gateway to the Rhinns of Galloway and for more than a century was a busy ferry port for services between south west Scotland and Northern Ireland. The town has many shops and there are plenty of places to dine out too. The town’s main attraction is the Castle of St. John, a ruined four-storey tower house built around 1500, which sits on a green in the main street, and there are several eye-catching artworks in the area surrounding the castle with Stranraer Museum in the old town hall. Close by are Castle Kennedy Gardens, with the castle, two lochs, a giant lily pond and an avenue of monkey puzzle trees. Logan Botanic Garden sits 13 miles south of the town and is home to exotic ferns and palms and boasts a beautiful walled garden. The area is steeped in history and the landscape diverse, a haven for artists, birdwatchers and walkers. Portpatrick, 8 miles, lies at the start of the Southern Upland Way, one of Scotland’s acclaimed long distance footpaths, covering 212 miles to Cockburnspath on the east coast. The Mull of Galloway with its grass roofed visitor centre is Scotland’s most southerly point with amazing views of Ireland, England, Isle of Man and Scotland. Lucky visitors may spot seals and minke whales and will most certainly see a host of seabirds. Take the high speed ferry to Ireland for a spot of sightseeing or a shopping trip to Belfast. The beach and shop are 500 yards, with the pub and restaurant 400 yards from Kinvara in Stranraer. Ground Floor: Living room: With open fire, 40 Freeview TV, DVD player and CD player. Bedroom 1: With king-size bed, double sofa bed and Freeview TV. First Floor: Bedroom 4: With double bed, double sofa bed and en-suite with shower cubicle and toilet. Gas central heating, electricity, bed linen, towels, Wi-Fi and fuel for open fire included. Cot and highchair. Welcome pack. 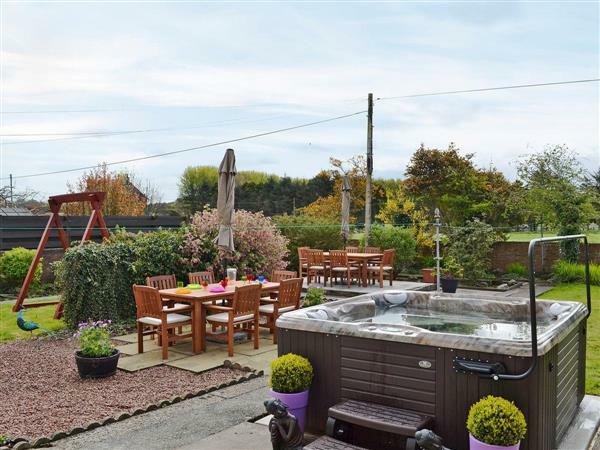 Large enclosed garden with sitting-out area and garden furniture. Hot tub for 6 (private). Bike store. Private parking for 6 cars. Wheelchair access. No smoking. Holidays at Kinvara run from Saturday to Saturday. For a better idea of where Kinvara is, you can see Kinvara on the map below. Kinvara is in Wigtownshire; should you be on the lookout for a special offer, you can find all the special offers in Wigtownshire. It's always worth checking to see what is on offer at the moment. Do you want to holiday near Kinvara (UK5385), you can see other cottages within 25 miles of Kinvara; have a look to find your perfect holiday location.